Sometimes tattoo artists face a problem when all the samples of tattoo inks in their collection are unable to procure the right shade. And doesn‘t seem to be really possible to have all the colors, nuances and undertones to satisfy real thirst of creativity. Luckily, tattoo inks can be mixed, diluted, blended, they can be made darker or lighter. A professional can create one’s own tattoo ink combining some new colors. Mixing gives a great opportunity to turn few colors into many tints. The only thing one should remember about is using proper methods of blending in order to prevent ink ruining. The main rule of successful mixing is to stir with sterile tools only. Breaking this important rule can cause a big problem of cross contaminating colors. If you come to mixing very often, an investment in an ink mixer would be reasonable. Do you find your red tone not quite dark enough to perform the dark blood you are going for? You can add some black ink to your red to get it to the desirable shade! Any color can be made darker just by adding some black. Be careful and add only one drop to mix at a time, try not to overdo it. Blend the black thoroughly to test the new color before adding more. Remember to use only sterilized tools for mixing. Though it seems to be a waste of one of your needles, but the knowledge that your ink is sterile is worth it. It is also easy to make your colors lighter using the same method as making them darker. The only distinction is that this time you will have to use white instead of black. There is one more variant – just add some distilled water, but first you should check if this method works with your ink. Once again, don’t forget to do the process of blending slowly by adding only one drop at a time. Remember that you can always add more white (or water) but if you make the color too light you can ruin the ink altogether. In this case you will have to start the process over. You can have your inks blended by putting two colors together in order to make a different color. 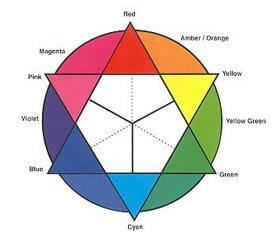 For example, yellow and red will make together an orange color. If you add more red, the new color will become a more reddish tint, in case you blend in more yellow, it will become more yellow tint. Mix blue and red to get purple. Green comes out of blue and yellow. To get orange bring yellow to red. If you need brown just mix green and red.